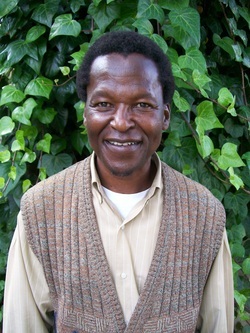 Solomon Sekhaolela, an Ndebele artist, was born in 1937 in Heidelberg, Gaauteng. In 1947 his family moved to Soweto, where he went to school. He spent a very happy childhood with his family. As a young boy art interested him and in his spare time he made clay sculptures and weaved Sotho hats. He was constantly drawing and painting from books, using mainly chalks. He is multi-talented being a cabinet maker, tailor, pattern designer, musician who composes his own songs and is a licensed fisherman. Solomon is comfortable in several media but at his best when using oil paints. He is highly inventive in his search for self expression. He developed for example, the idea of using a gardener's insecticide sprayer in a way that resembles so called "airbrush" work. His work can be described as sophisticated and many of his paintings, particularly his more abstract township scenes, contain excellent formal elements of composition, show great refinement of line and space, and there is a studied restraint in the use of colour. Other of his works are dream-scapes, portrayed in a personal manner with interesting atmosphere. He is able to create over a wide range of subject matter and his work is always thoughtful and well conceived. When he was twenty he marketed his paintings in curio shops around Johannesburg. This was the beginning of a serious professional career in art. His work can be found in corporations overseas, locally as well as in private homes. His work is represented at the University of Fort Hare.